I find that questions like this can be a lot of fun, providing people actually participate. I'm risking having resounding silence on this post, but what's the old saying... nothing ventured, nothing gained? Who am I? I am Captain William Avery. It's London in 1842, and those in charge of the Reform Club have insisted that I investigate a rash of poisonings that have befallen their membership. I have a wife who's working my last nerve. I have an infant son whom I adore, and the person who really should be investigating this mess is Jeremiah Blake, but he's experiencing some difficulties of his own at the moment. I'm getting to know London's first celebrity chef, Alexis Soyer, and being schooled in how the kitchen in such an establishment is run. I'm eating fine food, watching my suspect list grow longer and longer... and hoping no one else falls victim to the poisoner before I can identify the person. 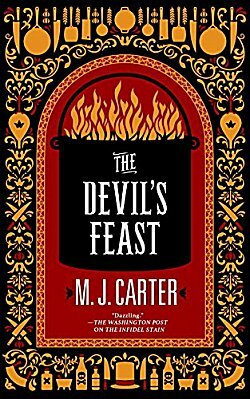 All in M.J. Carter's third Blake and Avery mystery, The Devil's Feast! Oh, I wish you'd told us the title and author, Margot! This sounds really interesting! It just went on my To-Buy list! I am Aaron Falk and I am a Federal Police Investigator who investigates possible financial crime. I am returning to Kiewarra Australia to attend a funeral of a childhood friend. My friend and his family except an infant have been found murdered. It is being called a murder/suicide. I am going to stay a few days at my friend's parents request to look into the crime. Kiewarra is going through an extreme drought and is ungodly hot. I feel the tempers of the towns people are ready to go off at any time. It is a very tense time. You can read about me and what I found out in a book called The Dry by Jane Harper. I picked this book up at The Poisoned Pen, Lynn, and I'm looking forward to reading it! Lol! 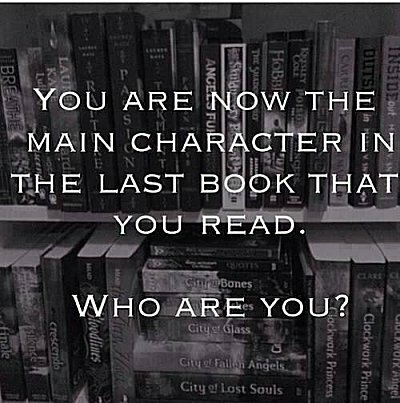 Erm...I'm apparently the ensemble cast of Heir to the Empire by Timothy Zahn. It's the first book in the Thrawn trilogy, the first of the post-Return of the Jedi books, written a number of years ago. I decided to re-read them because there's a new Thrawn book coming out next month. "I am James, the grandson of Frederick and Jette. This book is not a mystery. And in view of today's politics - topical. " The book is Alex George's A Good American. I looked it up, Reta, and it does sound like a good book. Thanks so much for sharing! "Oh dear, I'm afraid things might not being going well for me. I just finished The Last Policeman Trilogy books by Ben Winters, a cop procedural mystery series/near SF set in New England. In addition to solving a series of crimes, Detective Hank Palace has to face the additional challenges of working in a world threatened by an approaching asteroid. Sounds weird, I know, but the first book was the Winner of the 2013 Edgar® Award Winner for Best Paperback Original." Things aren't going well for you at all, but I must say that I did enjoy this trilogy. Perhaps it's morbid, but I've enjoyed a well-written "end of the world" tale since I was a teenager reading Pat Frank's Alas, Babylon. I am Mel Ferraira, of Portuguese nationality, who is a member of the Hate Crimes Union of the Peterborough police in England. I am investigating the murders of two trans women. Also, I am trying to figure out my personal life and the issue of relationships. I am thinking about bigotry and abuse towards transgender individuals, while investigating the murders. I am also worried about the future of the Hate Crimes Unit as funding is in question. I am a character in Eva Dolan's series, this one being titled, "Watch Her Disappear." And I am worried about the future of these characters as a reader. The ending is pessimistic, having caused me to mope for a few days. I love these books. And another series just went on my TBR list! I just hope Eva Dolan doesn't end it. Love Zigic and Ferraira as a team. He's a regular, low-key detective, but smart and has a family (and he helps out) and she's kind of a one-of-a-kind, just goes off to investigate crimes off the grid. And she is so smart and feisty. And yet compassionate to the victims. This is a great feature for this blog. I agree. I may have to do this periodically. Good idea because you and the blog's readers are all reading different books all of the time. However, the flip side of this is more books for the TBR list. For example, I had put The Dry on my TBR list and forgotten about it, but these comments just reminded me to find it somewhere. I haven't forgotten my copy-- it's staring at me from the shelf right now. I've just been swamped with other books, but I did read a friend's review of a book that reminded me that I had a book in that series sitting on the same shelf.